If you are using ACT Fibernet for your broadband internet connection, this guide is for you. 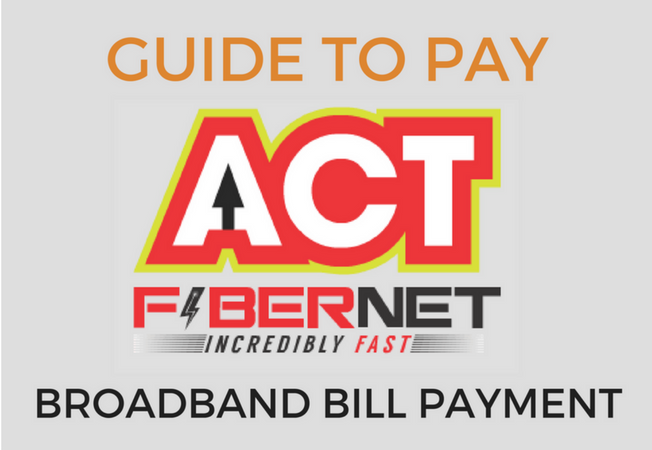 Here we have shared a complete guide to pay your ACT Fibernet Bill Payment Online. ACT Fibernet offers perfect and incredible Internet connection with the high speed of connection at affordable rates. Users of ACT Fibernet can stop to know for all information regarding ACT Beam bill payment in online. Different payment options are available to pay ACT Beam bill online like through Credit / Debit Card, Net Banking, etc. We have shared all information here with step by step manner. This post will surely help you to pay ACT Broadband Bill Payment in Online without any hassle. The full form of ACT is Atria Convergence Technologies Pvt. Ltd was founded in 2000. It is formerly known as Beam ACT Fiber. It is an Indian telecommunications company, the headquarter located in Bangalore, Karnataka. In July 2014, ACT Beam rebranded its broadband service from ACT Broadband to ACT Fibernet. It offers the home services under the brand name 'ACT Fibernet' and digital television services under the 'ACT Digital TV' brand. ACT Beam is the 3rd largest ISP in the wired broadband service category. ACT is one of the country's most renowned Triple Play Service providers. ACT Fiber serves many cities and towns in Karnataka, Andhra Pradesh, Telangana, Tamil Nadu and Delhi. It is providing their customer service for both home & corporate users. Corporate users can choose corporate broadband plans for high speed of internet connection to the business. It provides the Internet services to nearly 1.5 million subscribers. If you have any inquiries or want to know connection details, or you want to make complaints regarding your ACT Fibernet Broadband connection issues and faults, click here to check ACT Fibernet Customer Care number & Toll free number and other details. 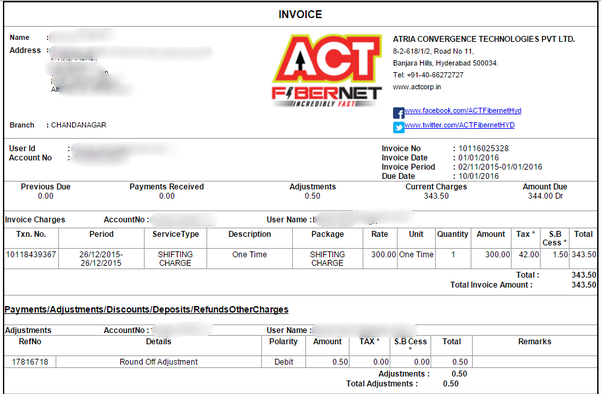 Now We will see how to make ACT Fibernet Bill payment online with different payment methods. Follow the below steps to complete your ACT Fibernet Bill Payment. 2. Select your city or region on the list. Find & click 'Pay Bill' on right side of the window. 4. Select Payment option -> Billdesk. Click 'Pay Now'. Now you will be redirected to the payment gateway page. 6. If you have selected credit card option and enter the 16 digit credit card number, CVV number, Exp date & Card Holder name mentioned in Credit Card. Click on make payment. 7. Now complete the payment authentication process with PIN or OTP. Once the payment authentication is successful, you will be redirected to the confirmation page. Here you can check the payment details of payment date, Bill amount, Track ID. You will also get the successful message through registered mobile. The other payment options of Debit Card & Net Banking are similar to Credit Card payment method. If you are choosing the Wallet Cash Cards option, you also have a chance to get ACT Fibernet Broadband bill payment cashback offers. After successful of ACT bill payment, your invoice will generate. It will look like the below image. After successful of ACT Beam bill payment, your invoice will generate. It will look like the below image. If you have any queries and suggestions regarding ACT Fibernet Broadband bill payment in online, do not hesitate to share with me through comment section in below.